In addition, the Parlor has a modern, comfortable queen-size futon; and the Office has a couch with a pull-out, double-size bed. The house also has one twin-size bed with twin-size trundle, one twin-size roll-away, one antique day-bed, and one crib. 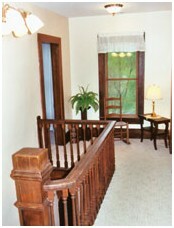 Caption: Portion of the upstairs hallway, looking toward the front of Stratton House. The Wildflower Room is to the left and Garden East is to the right.